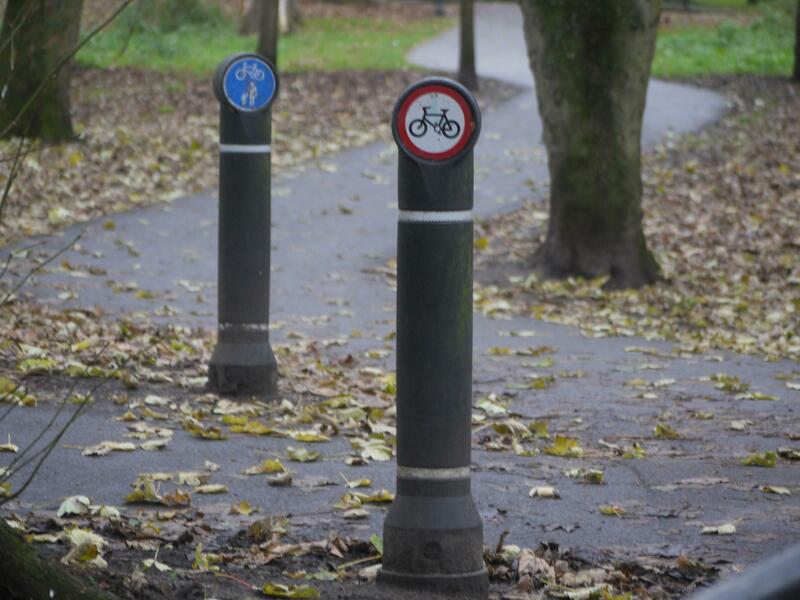 Charles Martin comments on a recent proposal to allow cycling on a footpath in Beddington Park, and recommends that context should not be overlooked when assessing consultation responses. He also suggests that the discussion, as to whether cycling should be permitted on a relatively lightly used footway within a very large park, pails into insignificance when faced with the much larger challenge of how to create a better environment on the main roads and residential streets around the park. In the autumn of 2012 Sutton Council consulted on a proposal to change the designation of a path in Beddington Park from its current status as a footway to that of a shared use surface between cyclists and pedestrians. It was all quite simple really. Many paths in this wonderful 100-acre space are already shared use, and this appears to be working well. The aim and objective of the conversion of this particular footway was to make it possible for people to enjoy a gentle circular preamble by bicycle around and completely within the park, something that was not permitted whilst the path remained designated as a footway. The path, at nearly 600 metres in length, was, and still is, the missing link in terms of providing this recreational opportunity. Beddington Park: can paths be agreeably shared? Living Streets uphold the principle that cycling space should not be provided at the expense of pedestrian space. This is set out quite clearly in their briefing on pedestrians and cyclists (PDF, 2.4MB) which includes the following text: “If it is deemed absolutely necessary to mix pedestrians and cyclists in the absence of motor traffic, space is crucial. We prefer separate, or at least segregated paths – particularly where cycle use is likely to be high – so as to mitigate the worst aspects of intimidation by inconsiderate cycling”. Consequently, the national organisation responded to the consultation in-line with this recommendation saying that they did not welcome the conversion of the footpath unless it was widened and segregated. The Ramblers took a similar view, and gave a preference for widening and segregation. Other respondents to the consultation supported conversion of the footway, with some opting for widening but no segregation and others for simply using the existing path. I responded to the consultation on behalf of Sutton Living Streets and supported the conversion but, unlike the national organisation, did not give a preference as to whether the path would benefit from widening or segregation. There were several reasons for this, including the recognition that the existing usage of the footways and cycle-paths within the park was low, and that many other paths were already shared and of similar width to the footway. It was also unlikely that the path, once converted, would generate any significant increase in cycling traffic (in the short term at least). Most importantly, however, just the conversion alone could have great potential in helping to encourage a new generation of people enjoying the benefits of cycling. Basically, the proposal to convert appeared to be a very good one, was long overdue, and, given the local context, would be most welcome in whatever form the implementation took at this stage. I believed that on this particular path, in this particular location, at this particular point in time, pedestrians and cyclists (predominantly novice) could co-exist in harmony, and share with due care. This initial consultation was an agenda item “Beddington Park cycle path” at the Beddington and Wallington local committee on 4 December 2012. In view of the responses received, a recommendation was proposed to undertake a formal consultation to widen the existing path and introduce segregation (although funding for this had yet to be identified). In support of my response, and for expedience, I suggested that a better option at the moment may be to simply change the footpath status to allow shared use. It was pointed out, however, that this could only happen if Living Streets removed their objection to an unsegregated option. Therefore, I agreed to lobby the national organisation to endeavour to make the case as to why the path could satisfactorily be used in a shared-use capacity in this specific case and at this moment in time, and to help with this prepared a discussion document “Beddington Park: a discussion about footways and cycle-paths” (PDF, 4.2MB). Not a very compelling title I will admit, but the document does include photos of the path to illustrate the concepts and explain the context, and hopefully gives a better overview of the situation than that contained in the Sutton Guardian article on the agenda item discussion “Plans to widen cycle paths in Beddington Park stall in council row”! I have to say that it has been quite useful giving some thought to this conundrum, looking at the process of the consultation, and attempting to put together some ideas. Because in preparing my discussion paper about Beddington Park, it has occurred to me that in some ways we are missing the bigger picture. After all, it’s all very well endeavouring to promote recreational cycling within the park – and having the use of a circular path in Beddington Park should enhance the space and be a great place for mums and dads to cycle with their young children (whilst not diminishing the enjoyment of those on foot) – but what are we actually doing outside the park to improve the public realm and encourage everyday cycling and more pleasant walking conditions? Isn’t it about time we started to address the greater challenge that relates to access to the park for instance? Just think how fantastic it would it be if Beddington Park was a great place to walk or cycle to, as well as within! Perhaps if we started a consultation with that as an objective, whilst taking a few ideas from the Dutch to show that it can be done, and adding some political-will into the mix too, then one day we would find that more of our short day-to-day journeys, for the young and old, able-bodied and less able-bodied, would be as easy as taking a walk in the park.